It’s official! SMEX has launched its new online learning platform NetHawwal. Starting today, a group of beta testers from 11 Arab countries will take part in an eight-week course sponsored by UNESCO Lebanon. The course material, available in Arabic and English, blends self-guided learning with virtual coaching by experienced SMEX mentors. The NetHawwal platform, built by Fusion Second, aims to help people of all ages develop the literacies and skills they need to take advantage of digital and social media to build people power and advocate for change. NetHawwal means “we transform” in Arabic. The first iteration of the platform is organized around common roles played in civil society and activism. Each role is personified by a friendly illustrated character who “guides” learners in the acquisition of specific skills needed to carry out that role. For example, the Citizen Storyteller will provide training in storyboarding and scripting. The Net Detective will teach users about strategic search and basic privacy and security. Illustrated guides personify the skill sets learners will acquire. In addition to streamlining and scaling its training offerings, SMEX hopes that this role-based learning will help participants gain the digital skills they need to compete and advance in an increasingly competitive global job market. Future plans include role-based learning for a variety of other non-advocacy-related skill sets. What guides would you like to see? The current beta testers will be guided by the Savvy Strategist and learn best practices for how to write SMART digital goals, develop strong messages, and make strategic media choices, among other key skills. Learners will also be asked to provide feedback during the course, which SMEX will use to refine the content and platform for future sessions. Embedded quizzes consisting of three question types—multiple choice, true/false, and open-ended—will test comprehension as participants move through the course. Open-ended questions will be reviewed by mentors, giving participants an opportunity to engage directly with experienced digital activists and strategists. Learners can also ask questions of peers and mentor by posting in a moderated Q&A forum. 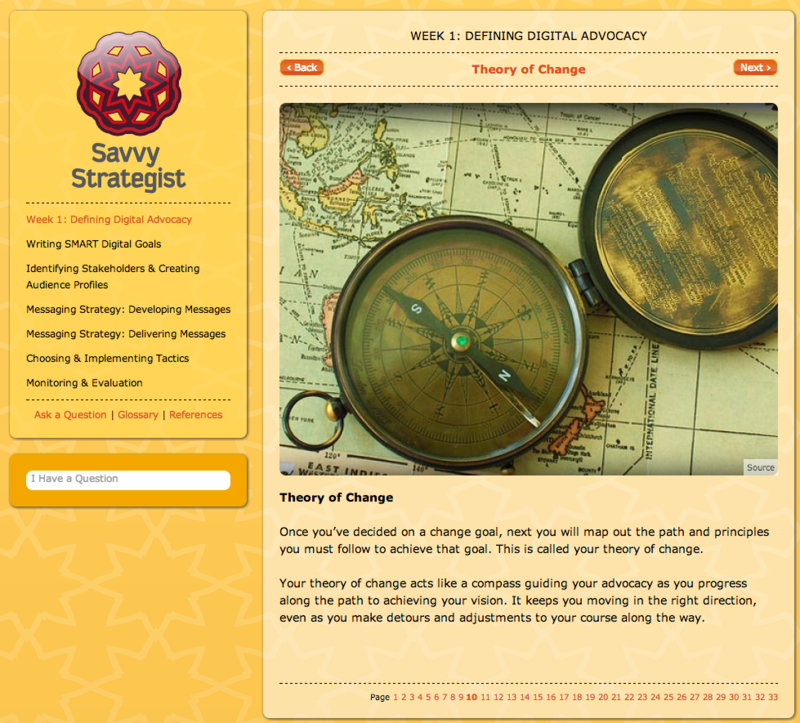 A learning page from the Savvy Strategist skill set, illustrated with a Creative Commons–licensed image. 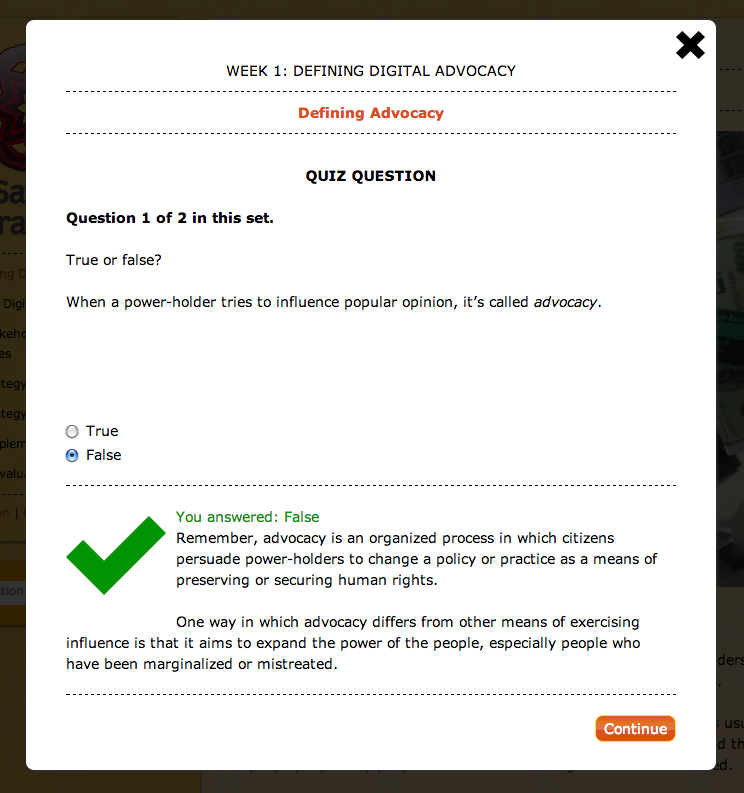 A pop-up quiz page with a correctly answered true-false question. NetHawwal consists of original content that draws on both first-hand knowledge and resources from Tactical Technology Collective, The Change Agency, New Tactics in Human Rights, and other leaders in the field. Creative Commons–licensed and public domain images illustrate the course, along with relevant videos and screenshots from examples of digital advocacy from around the world, with a specific focus on Arab examples. Unless otherwise noted, all site content is published under a Creative Commons Attribution Non-Commercial Share Alike license. Beta testers who finish the Savvy Strategist skill set will earn a badge and a certificate of achievement from SMEX and UNESCO. But they will also gain something far more valuable and elusive: a strategic understanding of how digital advocacy works and where it fits in the broader advocacy process. We hope this knowledge will help digital advocates build more successful campaigns in support of their change goals, expanding power and participation along the way. Registration for the first beta test is now closed. If you would like to be considered for a future session, please sign up now. If you have any other questions or comments, please get in touch with us at feedback@nethawwal.com. Hello, I desire to subscribe for this weblog to obtain most up-to-date updates, so where can i do it please assist. bⲟokmarked! !, I reallʏ like your blog! and teleconferencing that eliminate physical travel from the scheme of things, ranks as the biggest and most popular green business practice.